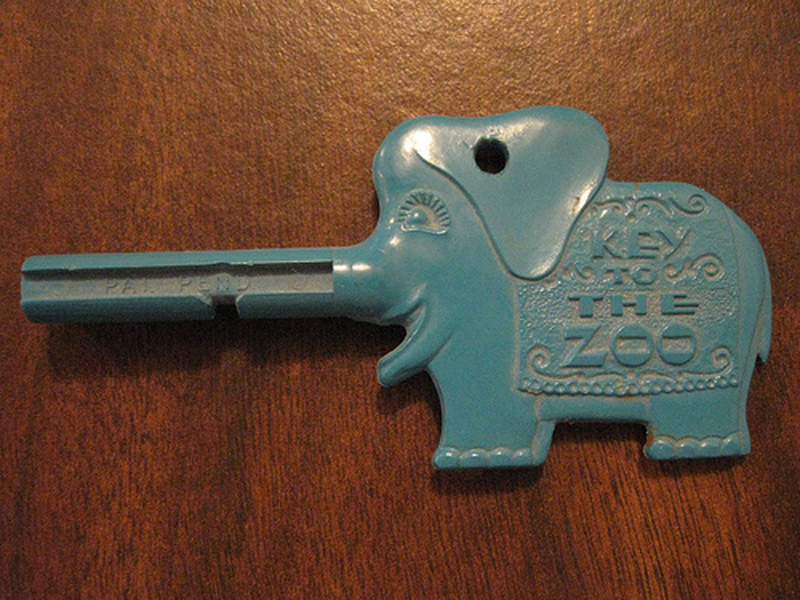 Adventures in Childhood Nostalgia | Cleveland Zoo Key | A Continuous Lean. The early 1950s saw the invention and introduction of “talking storybooks” that were dreamed up by Bay area native Bruce Sedley. The San Francisco zoo was the first American zoo to use talking storybooks and at the same time introduced the ingenious elephant shaped key called Trunkey the Elephant. 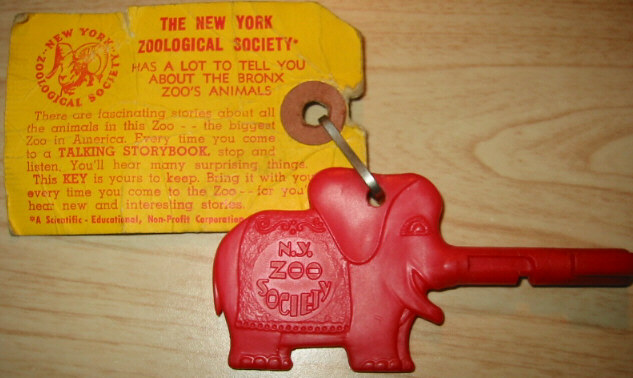 Cleveland, Detroit, Philadelphia, Cincinnati, San Francisco, New York (Bronx Zoo) all had their own talking storybooks and elephant keys. I remember bringing the key to the Cleveland Metroparks Zoo as a kid – something really special that I look back upon fondly. When I was home for the holidays my dad unearthed one of the keys our family had from the late 70s. It had been in his desk for the last 30 or so years. I’m glad dad never throws anything out. Anyone out there remember these things? Blue key image from Cleveland SGS. New York Zoo key via. I remember buying one of these when I was in elementary school and we went to visit the Philadelphia Zoo. Next time I’m home, I’ll look around for it, I know I’ve seen it in the past 5 years, so it should still be around. wow! these are beautiful !!!! It’s the little things that really count, isn’t it? I still have my keys from Philly. This is awesome. I am not old enough to remember these specific keys but I certainly remember the ones from my childhood. These are much cuter! Yes sir. I grew up in New Orleans and while I don’t remember these at the zoo, City Parks’ Storyland had these keys. for each play area you could enter your key to hear the story the area was designed around. I don’t remember being able to keep the key otherwise I’d have it today given my father doesn’t’ throw anything out either. Today, that key would make a pretty awesome key chain. A wonderful find. I visited the Cleveland Metroparks Zoo a few weeks ago and was reminiscing with my brother about school field trips to the zoo, and about how there used to be peacocks that would roam the zoo, screaming and scaring the ice cream out of people. We used to feed circus peanuts to the carp that lived in the pond–something tells me that would be frowned on today (and those carp would now be called “koi” and would be part of a species recovery plan). Children’s Fairyland in Oakland, CA (http://www.theimaginaryworld.com/cfl.html) still has storybook keys (http://farm1.static.flickr.com/17/21833322_bcd2e9a099.jpg?v=0) in action. I keep mine in my desk, ready to pass down to my son. I remember and still have mine from the Detroit Zoo. Good memories! Thanks for posting about FairyLand in Oakland! I was just about to add that one to the list. I remember that place almost as a dream; and was very surprised to drive past it as an adult and find out it really did happen! I have one from the Philadelphia Zoo that I found at an outdoor flea market for $1! It still has the tag attached and I now have it on a shelf where I stare at it from time to time. Digital exhibits can’t compete with a keepsake like this! I had one for the Detroit zoo, we used to go there alot for family outings for some reason. I haven’t thought about those things in years and years. I remember my mother giving my brother and I one (1) key to share, not sure why she thought we would follow-through on the sharing part. We would fight over who was going to hold the key, etc. One visit my brother refused to walk unless he was able to carry/hold the key. My mother was so upset that I remember leaving my brother and walking with-out him. (today she would have been reported to Child Services) I am sure by the end of the visit to the zoo, my mother was cursing the key. I called her this AM to see if she still have it, she is looking this afternoon, but it does bring back great memories! Gotta love the Cleveland Zoo. NEO had some great attractions, Zoo, Sea World, Geauga Lake, great place to grown-up! 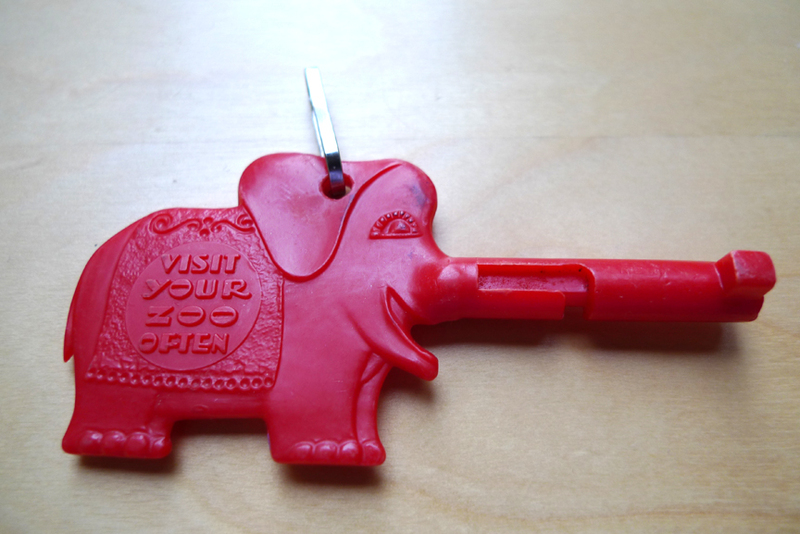 Growing up in San Francisco in the 80s, we was crazy for them zoo keys. I had a drawer full of them at home, and yet, I â€” and all of my classmates â€” always managed to forget to bring even one on the annual school field trip. But that was okay, because most of the fun of the annual zoo field trip, aside from Monkey Island (RIP), was fashioning crude zoo key replicas from twigs, and “stealing” the information contained within each talk box. These counterfeit keys actually worked and we felt like little MacGyvers. In retrospect, I imagine our teachers must have been amused to see us all leaning over to listen to the small speaker, eager to absorb the informational tidbits we had unlocked with our cunning. We’d stop at the West Side Market and buy out-of-date oranges for next to nothing; and throw ’em to the bears. Wow! that was something I haven’t seen in many,many years. I Had one,and I must have gotten it at the Brookfield Zoo in Chicago (I’m not even sure of the name of the zoo anymore). I grew up out side of Philadelphia and remember our key being yellow. Although I harbor pack rat-like tendencies, my parents subscribe to the clean slate theory of living which means the only thing left of the key is a blurry, grainy burst of yellow in my brother’s hand as he taunts me with it in a home movie from 1969. I want that key back! I remember these keys. Back in the early 60’s my grandparents used to take us kids to Deer Forest in Coloma Michigan. The key we got back then was yellow and unlocked a box that described the particular animal(s) in the caged area you were looking at I’m pretty sure I’ve got one stashed away in my stuff but I’m pretty sure it’s blue. I think the company that made these speaker boxes custom made these keys for the particular zoo or animal park that installed the speaker boxes. I lived in the Cleveland area and made several trips to the Cleveland Zoo in the mid 60’s. I still have my key and remember fondly walking from area to area and rushing up to use my key and hear details of that animal. Thanks for triggering such a great memory. check out e bay “flooperdave or “zoo key” I have placed it on there – a great memory and conversation piece Along with the little gem from the BLUE HOLE in Sandusky any one remember that ? Wow these are amazing! I was born in the late 80’s so I have no known recollection of these but they’re great! i wish i still had mine from the turtleback zoo in west orange, nj.